Cornerstone (with My Hope Is Built on Nothing Less and He Is Lord). By Hillsong. By Eric Liljero, Jonas Myrin, and Reuben Morgan. Arranged by Heather Sorenson. For Choral (SATB). PraiseSong Choral. 16 pages. Published by PraiseSong (HL.125214).Uses: General, Christ the KingScripture: Psalm 118:22-24; Ephesians 2:14-22; I Peter 2:4-6The hymn “My Hope Is Built on Nothing Less” is the foundation of this favorite song from Hillsong Music. 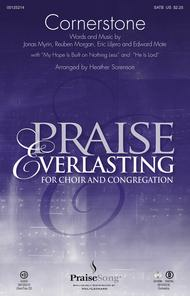 With two distinct endings – one that features the choir only, and an extended medley option for choir-led congregational worship – Heather Sorenson's stellar arrangement is sure to create a powerful moment in your services. Score and Parts (fl 1-2, ob, cl 1-2, tpt 1-3, hn, tbn 1-2, tbn 3/tba, perc 1-2, hp, rhythm, vn 1-2, va, vc, db) available on CD-ROM and as a digital download. 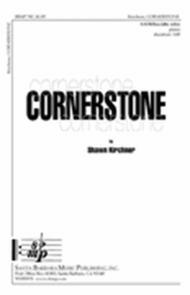 Cornerstone composed by Shawn L Kirchner. For SATB choir, alto voice, baritone voice, piano. Concert. Medium. Octavo. Published by Santa Barbara Music Publishing (SB.SBMP-747).The composer pulls out all the stops on this gospel piece. The piano part soars; the two soloists dramatically rise above the choir. Female and male choral trios give the piece authentic gospel style. 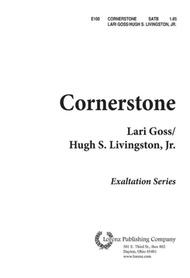 Cornerstone composed by Lari Goss. Arranged by Hugh S Livingston Jr.. For SATB choir. Exaltation Series. Sacred Anthem. Octavo. Published by Lorenz Publishing Company (LO.E100).